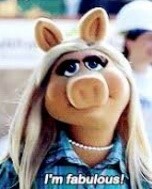 Desiderata meets Miss Piggy — Wynn Helms, M.A. This and the following highlighted lines are from my favorite poem, Desiderata, written by Max Ehrmann circa 1927. December can be hard for people who don’t have a family support, who are not “coupled” and/or who aren’t part of a friend group. Doesn’t it seem as though everywhere you look –especially on social media—there are smiling couples, families and friends enjoying the season? But there are lots of people who spend the holidays feeling lonely. Remember that “alone” doesn’t necessarily mean “lonely”. One of my favorite authors of wit and wisdom, Missy Piggy, said, “Haven’t you heard? One is the new two.” Many people can find it freeing and invigorating to be alone—while not considering it a “lonely” experience. I had an insight once as I stepped on board a dreadfully full airplane. I was on my way to relax from the “noisy confusion of life”. As I boarded, everyone seated seemed annoyed in the stuffy, cramped cabin. I was annoyed and bothered too. My only thought was getting to my seat and falling sleep. While I squeezed through the madness of coach class, I kept repeating “find the joy, find the joy”. I finally found a seat. It was still hot and stuffy but I was able to stay calm and to be grateful that there were no infants travelling coach that day. Mostly, I felt grateful and blessed to be able to take a trip at all. Stay in the moment. Breathe and find the joy. Celebrate and enjoy your friends and loved ones if you are fortunate enough to have them. Embrace your solo experience by recognizing the invisible yet tangible gifts that you have. Maybe just look in the mirror—like Miss Piggy often does, and appreciate how fabulous you really are! It’s not conceit. It’s the realization that you are a treasure. Treat yourself like one and teach others to treat you like one too.